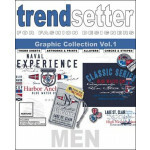 Graphic book with a variety of approximately 300 print designs for men with particular attention to colours and shapes. 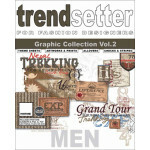 Graphicstore Men is produced for designers and product developers for fabric and fashion areas as well as for the areas of interior decoration, gift wrapping paper and many other product lines. All design elements are also provided licence-free and ready-to-use in vector format on the enclosed DVD. Hardcover, 24 x 31 cm, 144 pages, approx. 300 graphics.